The conservation movement, also known as nature conservation, is a political, environmental and a social movement that seeks to protect natural resourcesincluding animal, fungus and plant species as well as their habitat for the future. The early conservation movement included fisheries and wildlife management, water,soil conservation and sustainable forestry. The contemporary conservation movement has broadened from the early movement’s emphasis on use of sustainable yield of natural resources and preservation of wilderness areas to include preservation of biodiversity. Some say the conservation movement is part of the broader and more far-reaching environmental movement, while others argue that they differ both in ideology and practice. Chiefly in the United States, conservation is seen as differing from environmentalism in that it aims to preserve natural resources expressly for their continued sustainable use by humans. In other parts of the world conservation is used more broadly to include the setting aside of natural areas and the active protection of wildlife for their inherent value, as much as for any value they may have for humans. The nascent conservation movement slowly developed in the 19th century, starting first in the scientific forestry methods pioneered by Prussia and France in the 17th and 18th centuries. While continental Europe created the scientific methods later used in conservationist efforts,British India and the United States are credited with starting the conservation movement. Foresters in India, often German, managed forests using early climate change theories (in America, see also, George Perkins Marsh) that Alexander von Humboldt developed in the mid 19th century, applied fire protection, and tried to keep the “house-hold” of nature. This was an early ecological idea, in order to preserve the growth of delicate teak trees. The same German foresters who headed the Forest Service of India, such as Dietrich Brandis and Berthold Ribbentrop, traveled back to Europe and taught at forestry schools in England (Cooper’s Hill, later moved to Oxford). These men brought with them the legislative and scientific knowledge of conservationism in British India back to Europe, where they distributed it to men such asGifford Pinchot, which in turn helped bring European and British Indian methods to the United States. 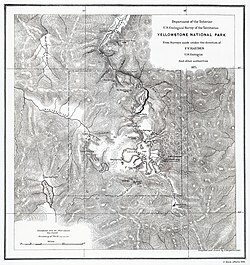 f.v hayden map of yellow-stone national park,1871. Sivaramakrishnan (2009) explores the boundaries between wildness and civility in Indian society, as well as connection of ideas of nature to different aspects of social life, especially labor, aesthetics, politics, commerce, and agriculture. These interconnected historical processes inform environmental history in India. At present forest history is the area of environmental history in which the most important scholarly debate is underway in India, with special interest in questions of water, air, industry, and climate change. At the grass root level are organizing mass movements with the theme of Think Globally-Act locally for conservation of nature since 1993 by Vijaypal baghel, peoples are called him ecoman, greenman etc. So many events are conducting as well as Jhola Aandolan against plastic carry bags use, Global green mission, Operation water reservoir, stop global warming & climate changes, reduce pollution with dedication to save environmental and spiritual values. Roosevelt put conservationist issue high on the national agenda. He worked with all the major figures of the movement, especially his chief advisor on the matter, Gifford Pinchot. Roosevelt was deeply committed to conserving natural resources, and is considered to be the nation’s first conservation President. He encouraged the Newlands Reclamation Act of 1902 to promote federal construction of dams to irrigate small farms and placed 230 million acres (360,000 mi² or 930,000 km²) under federal protection. Roosevelt set aside more Federal land for national parks and nature preserves than all of his predecessors combined. Roosevelt established the United States Forest Service, signed into law the creation of five National Parks, and signed the year 1906 Antiquities Act, under which he proclaimed 18 new U.S. National Monuments. He also established the first 51 Bird Reserves, four Game Preserves, and 150 National Forests, including Shoshone National Forest, the nation’s first. The area of the United States that he placed under public protection totals approximately 230,000,000 acres (930,000 km2). In May 1908, Roosevelt sponsored the Conference of Governors held in the White House, with a focus on natural resources and their most efficient use. Roosevelt delivered the opening address: “Conservation as a National Duty.”. In 1903 Roosevelt toured the Yosemite Valley with John Muir, who had a very different view of conservation, and tried to minimize commercial use of water resources and forests. Working through the Sierra Club he founded, Muir succeeded in 1905 in having Congress transfer the Mariposa Grove and Yosemite Valley to the Federal Government. While Muir wanted nature preserved for the sake of pure beauty, Roosevelt subscribed to Pinchot’s formulation, “to make the forest produce the largest amount of whatever crop or service will be most useful, and keep on producing it for generation after generation of men and trees. 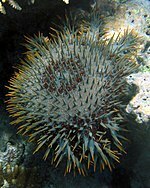 the great barrier reef, under protection.